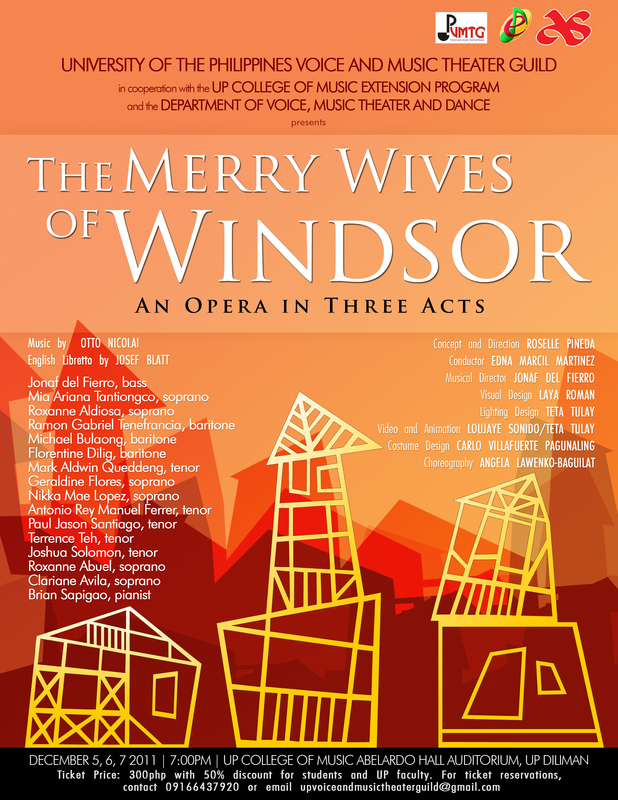 The University of the Philippines Voice and Music Theater Guild (UPVMTG) will be staging its annual major production The Merry Wives of Windsor: An Opera in Three Acts by Otto Nicolai and adapted in english by Josef Blatt, this coming DECEMBER 5, 6, 7, 2011 7PM at the Abelardo Hall UP College of Music, Diliman. The opera is based on William Shakespeare’s comedy about the mischievous and fallen knight, Sir John Falstaff and his tricks on two families of Windsor, the Pages and the Fords. Directed by Roselle Pineda, choreographed by Angela Lawenko-Baguilat, and visualized by a brilliant team of animators and artists, Laya Roman, Loujaye Sonido and Teta Tulay. The cast dominated by young and upcoming opera singers Aya Tanciongco and Fame Flores, combined with veterans, Jonaf del Fierro, accompanied by the UP Arko, to be conducted by Michy Martinez, we assure you that this offering is one innovative, visually rich, and fun opera to watch. Regular tickets are at P300 with 50% discount for students. For further inquiries and ticket reservations, please contact Stefanie Quintin (upvoiceandmusictheaterguild@gmail.com / 09166437920). This entry was posted in Awit at Musika, Teatro and tagged dula, kababaihan, love, music, opera, Shakespeare, theater, University of the Philippines, UPVMTG, women. Bookmark the permalink.